While the essential (which means humans require this in their diet) fat omega-3 is found in high levels in certain fish, most seafood that Americans eat on a regular basis like our white fish and shrimp are not very high in omega-3. Additionally, there are growing concerns about contaminants in fish and concentrated fish oil including mercury and PCBs. Finally, there are also increasing concerns about the rancidity and oxidation of over-the-counter omega-3 supplements changing a once healthy oil into a harmful one. With all of these concerns, it is good to consider other natural and fresh sources of omega-3. It is interesting that fish high in omega-3 also require omega-3 in their own diet. In the case of these fish, they get their omega-3 from sea vegetables and blue-green algae. Now, when the topic of plant-based omega-3 is raised, it is important to introduce the complicating fact that there are a whole family of omega-3 fats with varied biologic properties. The omega-3 family of fats contains differently size molecules and differently structured molecules. Most of us have heard about the health benefits of docosahexaenoic acid (DHA) and eicosapentaenoic acid (EPA) found in animal (including grass-fed beef), fish, or cod-liver oils. Most pregnant women know that breast milk is high in DHA and supports brain development of their child. 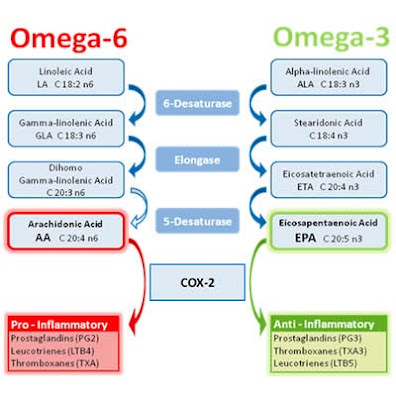 However, most plant-based omega-3 sources do not contain much DHA / EPA. Most plant-based omega-3 sources are high in Alpha-linolenic acid (ALA), which is another type of omega-3. ALA is found in plant sources like flax, chia, hemp, walnuts, and vegetables. ALA is inefficiently converted into DHA and EPA in humans through multiple energy-dependent enzymatic steps. Our grocery store has a very limited diversity of the edible plants from our environment. Many plants that are deemed "weeds" and eradicated from landscapes are indeed very nutritious and can be produced cheaply, without pesticides, and eaten much fresher than salad from our local store. Purslane is one example. Recent research demonstrates that purslane has better nutritional quality than the major cultivated vegetables, with higher beta-carotene, ascorbic acid, and alpha-linolenic acid . Additionally, purslane has been described as a power food because of its high nutritive and antioxidant properties . Different varieties, harvesting times, and environmental conditions can contribute to purslane's nutritional composition and benefits . Purslane is a very good source of alpha-linolenic acid. Alpha-linolenic is an omega-3 fatty acid which plays an important role in human growth and development and in preventing diseases. Purslane has been shown to contain five times higher omega-3 fatty acids than spinach. Omega-3 fatty acids belong to a group of polyunsaturated fatty acids essential for human growth, development, prevention of numerous cardiovascular diseases, and maintenance of a healthy immune system . Our bodies do not synthesise omega-3 fatty acids. Therefore omega-3 fatty acids must be consumed from a dietary source. Omega-3 fatty acids contain 18 to 24 carbon atoms and have three or more double bonds within its fatty acid chain . Fish is the richest source of omega-3 fatty acids. Health authorities highly recommend that we consume fish regularly to meet our bodies' requirements of omega-3 fatty acids, as other sources are limited and do not supply nearly as much omega-3 fatty acids . Purslane has recently been identified as the richest vegetable source of alpha-linolenic acid, an essential omega-3 fatty acid . The lack of dietary sources of omega-3 fatty acids has resulted in a growing level of interest to introduce purslane as a new cultivated vegetable [11, 12]. 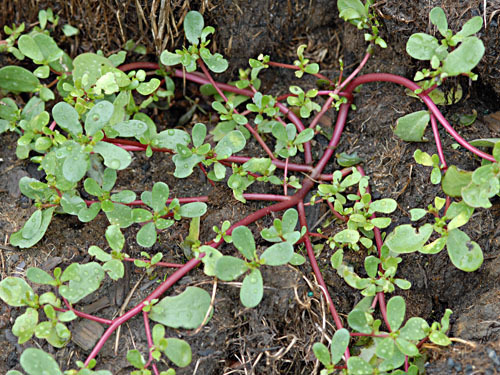 Purslane flourishes in numerous biogeographical locations worldwide and is highly adaptable to many adverse conditions such as drought, saline, and nutrient deficient conditions .